It’s also perfect for dinner (with a salad), a snack or when entertaining. Of course The French would take the pedestrian ham-and-cheese sandwich and elevate it on a culinary pedestal and accent it with a creamy Mornay sauce. It’s what they do. And you can do it, too. 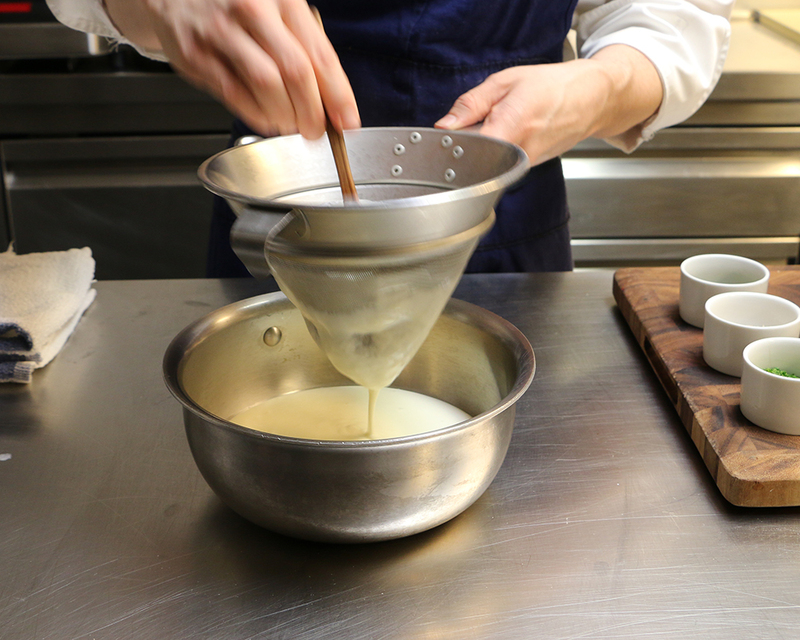 We went behind the scenes with Luther Dowdy, Chef de Cuisine at Bouchon Bakery & Café, who shared some of the fun facts about this classic found at The Shops at Columbus Circle as well as the recipe and some insider tips. 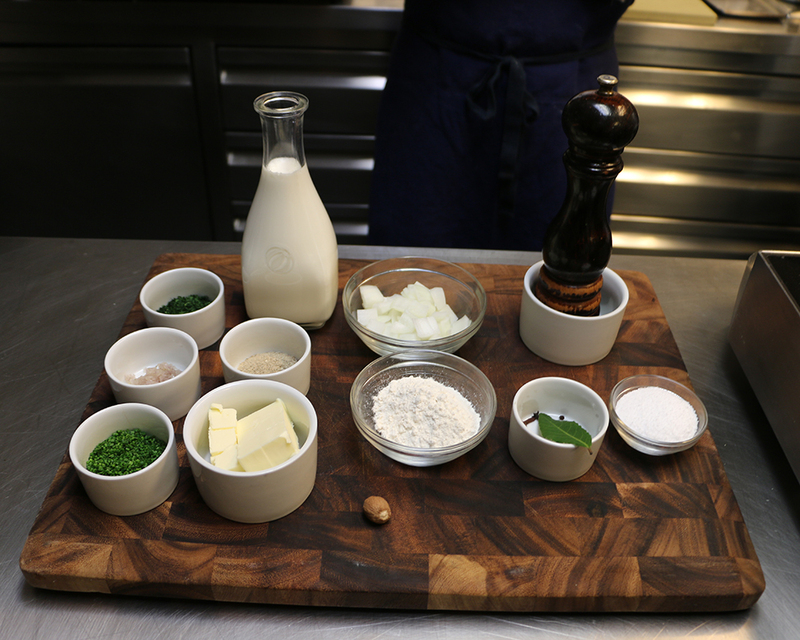 First, even in its simplicity, it is all about the ingredients. The taste is in the details. For example, the butter is clarified, the bread is homemade Brioche, and the cheese is Swiss that has a nutty flavor, body, and holds up when you melt it. Bouchon Bakery & Cafe uses homemade Brioche, but at home you can use white sandwich bread, sourdough bread, or potato bread. But Brioche is the best — it has that buttery goodness. Then there is the Mornay sauce. It’s the mother sauce (the basic white roux sauce) and you make it by adding grated cheese accented with some nutmeg. All of a sudden you have a culinary masterpiece. 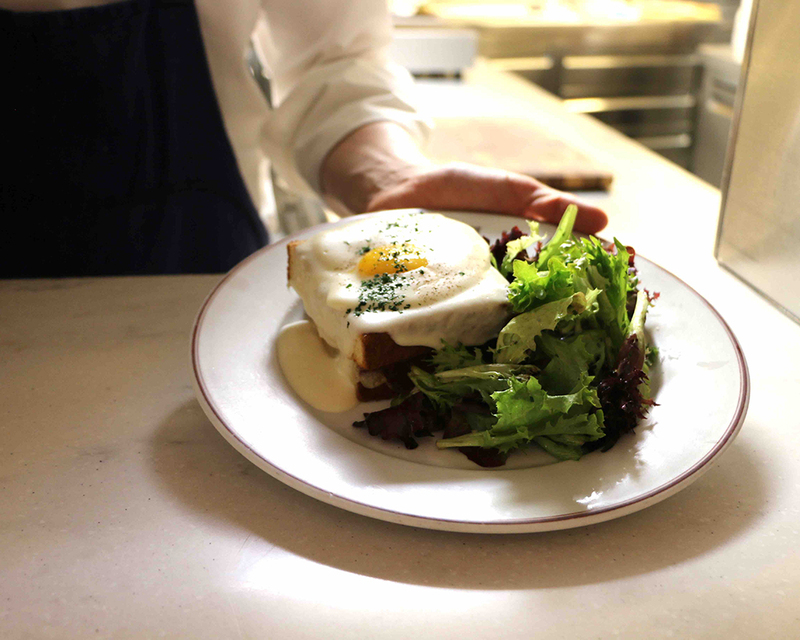 Skip the sunny side egg and you’ll have a Croque Monsieur. Everything you need can be found at Whole Foods Market at The Shops at Columbus Circle or in your neighborhood supermarket. Lay out the bread slices. Divide the ham among them, making sure it doesn’t extend over the edges of the bread. Place the cheese over the ham. If the cheese is larger than the bread, bend it over to fit. Heat two large ovenproof nonstick pans or griddles over medium heat. (If you have only one large pan, make 2 sandwiches and keep them warm in the oven while you make the second batch.) Add 1 tablespoon of the butter to each pan. When it has melted, add half the bread cheese side up to each pan and cook for 1 to 2 minutes, or until the bottoms are golden brown. Transfer the pans to the oven for 2 to 3 minutes to melt the cheese. Meanwhile, melt the remaining 1 tablespoon of butter in a large ovenproof skillet and fry the eggs. Cook the eggs until the bottoms are set, then place the skillet in the oven for a minute to set the top of the whites. When the cheese is melted, remove the sandwiches from the oven. Place 2 slices together to make each sandwich and put each sandwich on a serving plate. Place an egg on top of each sandwich. Pour about 1/4 cup of the sauce over the white of each egg, leaving the yolk uncovered. Grind black pepper over each egg and garnish the eggs with a diagonal sprinkling of chopped parsley. Serve with frites, if desired. Mornay, a roux-thickened white sauce, is a luxurious cheese sauce that we use for gratinéed scallops, macaroni and cheese, croque-monsieurs and -madames, and crêpes. Remove the sauce from the heat and season to taste with salt, a grating of nutmeg, and a pinch of white pepper. Strain the sauce, add the cheese, and whisk to melt. Use immediately, or place in a storage container, press a piece of plastic wrap against the surface to keep a skin from forming, and refrigerate for up to a week. If the sauce is too thick after refrigeration, it can be thinned with a little heavy cream. Variation: For 3 cups sauce, use 4 tablespoons (2 ounces) butter, 2/3 cup diced onion, 1/4 cup flour, 22/3 cups milk, 11/3 cups cream, 4 peppercorns, 4 cloves, and 1/2 cup cheese. Make the sauce in a large saucepan. Excerpted from Bouchon by Thomas Keller (Artisan Books). Copyright © 2004. If you do visit Bouchon Bakery & Café or make this at home, tag us on Facebook at @theshopsatcolumbuscircle and @bouchonbakery, on Twitter @TheShops_ColCir and@bouchon_bakery, or on Instagram at @theshopsatcolumbuscircle and @bouchon_bakery, #DineColumbusCircle.